UPDATE: I’ve gotten quite a bit of feedback on this one- I appreciate it, and just want to point out that this story hasn’t been edited or revised- it’s something of a peek into Josephine’s everyday life, and it’s something that I’ll revisit at some point to improve. I wrote it rather quickly, and it shows. For now, enjoy a quick glimpse into Josephine’s routine. It’s the last minute of the last hour of the last day of the year, and as part of a tradition I started in 2012, I’m releasing something cool. For free. 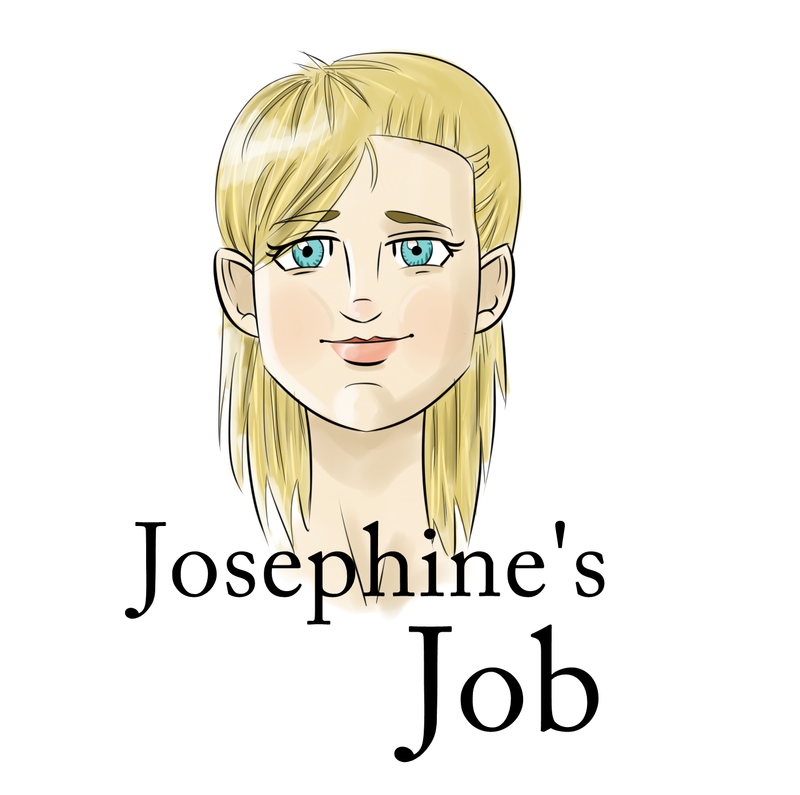 Right now, I’m releasing Josephine’s Job, a short story that revolves around one of the characters in Me Squared. It’s slightly experimental and made with love- it’s raw and unedited and has a couple rough patches, but I generally like the way it came out. It seems to suit Josephine’s character. Enjoy! Also, my fantastic artist made me a nice cover image- if you need a book covered, check out Book Covered. Helene’s hands shook. She convinced herself that she wasn’t scared; she’d found too good a deal to be too scared to follow through. Helene had gone too far to back out. Too good, too far, not too scared. She couldn’t help but feel less than comforted by the brutal sterility of the waiting room she’d spent the better part of her day in; it was a cold room with a concrete floor and notably ugly metal chairs. The Stuqe medical facility was a rather unusual place- it was nothing like the bright and welcoming space in the brochure she read. A woman was leading her through a corridor to the doctor’s “office”, and she was just as welcoming as the waiting room. The little blonde woman seemed like an unfeeling little girl- her cold blue eyes and unstyled shoulder-length blonde hair was reminiscent of a doll that nobody ever played with. In her years on the streets, Helene had seen some strange folks. There was Nancy, whose wild eyes stared in two different directions- leading to her untimely demise by truck. “Bless her soul,” thought Helene. There was Ricky, who was also Justin and Taylor and Rob, depending on when you talked to him- he wasn’t quite right in the head. Now was this woman, the lonely doll. “Josephine.” She spoke just above a whisper, her gentle voice finding little haven in the once-white walls of the long, dim hallway. “Thanks.” Helene’s shaking hands found no solace in Josephine’s words. They were too cold to help. Josephine led Helene to a door at the end of the hallway. Josephine walked away. Helene’s hands shook as she grasped the silvery knob and opened the door. She was ready to carry another woman’s baby. Amy sat in the waiting room, twisting her greasy brown hair between her fingers. She’d been waiting awhile for another baby- it had been a month since the last time she bore a clone. “Gonna get clone today, gonna get a clone ba-bay,” she sang to the empty room. The door at the far end of the room swung open. “Doctor Valentine will see you now,” Josephine half-sighed. The two walked down the barren and gritty hallway. “Josie, has anybody ever told you that you’re ambivalent? You’re ambivalent.” Josephine paused, and turned to face Amy. Her large blue eyes seemed fixed- Amy couldn’t recall ever having seen them shift position. She only ever turned her head to look at things. “Sure thing, Josie!” Josephine walked away. “What a weirdo,” Amy muttered as she opened the door. Rose sat with her legs wrapped one about the other, wringing her hands. She’d been without an address for the past few months. Having had a falling out with her parents (who promptly evicted her from the warmth of their home), Rose found herself sleeping in a stranger’s garden. It wasn’t too bad during the summer months- a Rose sleeping in a flowerbed was, to her, somewhat poetic. The trouble was winter. When the cold and frost and snow comes, roses don’t tend to fair particularly well- especially if they’re strange girls in their early twenties with no employment to speak of. On a particularly cloudy day, Rose was collecting cans on the street when she was approached by a short man in semi-formal clothing- he introduced himself as Victor. He told her about an opportunity to make an honest living and help a couple whose newborn was in danger. Reluctantly, she gave this strange, short person her trust. And now, here she was, waiting to become surrogate mother to a clone. The door at the far end of the room swung open, and Josephine walked in. Rose unfurled her legs and sprung up, her hands slick with sweat. “Yes, you’ll be implanted with an embryo,” replied Josephine flatly. Rose’s nose turned red, and her voice began to quake. At this point, Rose was crying. Josephine took her hand, and half-led, half-dragged her to the hallway. “You need to hurry, the embryo will not remain viable if you continue to delay.” Rose nodded and sharply inhaled in an attempt to clear her nose. She couldn’t help but begin to hate Stuqe. She hated the place that was giving her food and shelter and money. “Whatever you want.” Rose wiped her eyes with her free hand, and though her view was fuzzy, she could see that she’d reached a dead end- the door. Josephine opened the door and walked into the operatory. Doctor Scott Valentine stood beside a gurney in the middle of the harshly lit room, frowning. He handed his quivering patient an orange plastic clipboard with several sheets of paper attached. “I don’t expect you to read it all, since I never have,” he shrugged. “Just look at the last sheet, check the box if you plan on living here, and sign the bottom line.” Rose nodded vigorously, her black hair leaping about. The clipboard seemed too big for her hands. The doctor paused a moment- his bright blue eyes had involuntarily filled with water. “I asked a patient that very question It was a long time ago. Josephine stood beside the bed- though her feet were planted on the filthy tiles, she seemed to be floating purposelessly in the room. Rose winced as Doctor Valentine impaled her arm with a syringeful of anesthetic. She hadn’t expected something that would stop her from feeling to hurt so much. Rose’s eyes felt as though they were falling shut, and she replied with what she thought sounded something like “Allie”. “Good job, Josie,” Doctor Valentine said to his daughter as he put on a surgical mask. For a moment, he thought he caught the glimmer of a smile in Josephine’s face. He couldn’t be sure- he never quite was. Jourdan, do not leave me hanging. Hurry up with the continuing intrigue about Josephine’s job.